Ask a person to explain the universe is and guaranteed you’ll receive an answer just as expansive. Frustrating to conceive of an area that defies convention. For that’s what it is: an enigma. Sure, scientists the world over have struggled to define just exactly what it is that the Earth inhabits and how it came about to be. Mathematical calculations summarize what is perceived to be forces governing its structure, but as soon as one explanation arises, another takes its place. Take, for instance, the recent talk about finding traces of waves of the original big bang isn’t all it seemed to be. Could be interstellar dust, although optimism remains that perhaps evidence of the Big Bang is still present in the astronomer’s findings. And not to discount their discovery, because if they truly do find remnants of all that is, ever was and will be, my God, that’s like touching the face of eternity. Though I’m not a scientist, I do wonder how an event so enormous, so unfathomable to most mortals, could have left a trail of crumbs in its wake. It has been determined that the universe began 13.798 ± 0.037 billion years ago, more or less. That’s all calculation, the only tool available to determine its age. It’s also calculated that the observable universe is 48 billion light years in size. Nothing to sneeze at, of course. These numbers are only the result of of the logic of numbers and not the result of a person who stood at the rim and said, “Well, then, here we are…at the end.” Unless, of course, you’re a person named Doug who’s actually hitchhiked your way from one end to the other. In my opinion, he’s in a place to know at present, but he’s not giving up his secrets anytime soon. My mind shuts down when I contemplate the enormity of all there is. It gets worse when I attempt to ponder what caused its creation. 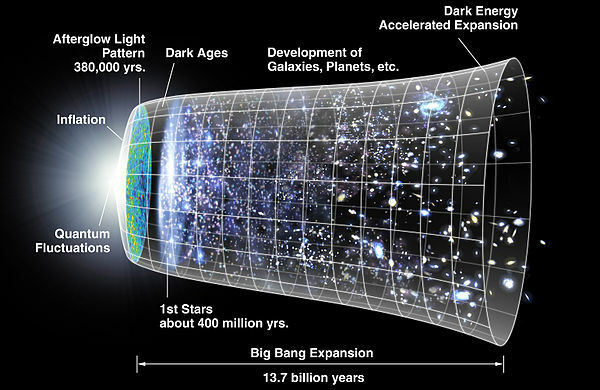 That Big Bang came out of…what? What was before it? Could it be that there was a universe that lived, breathed and died before it? Or perhaps time bent backwards and regenerated its youth to live in another incarnation? Only the eternal reaches of the universe and time can tell.